Avni’s photo appears in the newspaper because of her participation in Gen next fashion show. 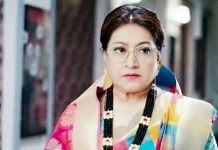 The article upsets Avni, as she is accused of being an illegitimate child. Avni cries reading she is a sin child. Fatima and Aladin get upset when Avni tells the shocking news to them. Avni does not get discouraged by the piece of news. She tells Fatima that she will win the fashion show and none can stop her from earning a big name. Later, Avni gets the news that police has arrested Asha for no offence. Avni runs to Fatima and tells about Asha’s arrest. Police does not give any explanation. Avni doubts Dayavanti is after this arrest and goes to confront her. She begs to Dayavanti to let her mother free. Dayavanti keeps the condition infront of Avni, asking her to take her name back from fashion show. What will Avni do now? Keep reading.